Jammu & Kashmir Current Events - Chharri Mubarak reachs Martand Temple. The Chharri Mubarak led by Mahant Depinder Giri duiring Poojan at the Temple. Srinagar, July 31 – The Chharri Mubarak of Shri Amarnathji was received at Martand Temple, Mattan amid chanting of religious prayers and mantras. A huge number of people from all walks of life present on the occasion paid obeisance of the Holy Mace and sought blessing of Lord Shiva. The Chharri Mubarak led by Mahant Depinder Giri left for Holy Cave from Dashnami Akhara Srinagar last Sunday and reached Mattan today. After performing puja at martand temple, the Holy Mace will be taking the traditional route passing through Pahalgam, Chandanwari, Sheshnag, Panchterni reaching the Holy Cave for Darshan on Shravan Purnima. The historical temple of Martand where the Holy Mace was received has great significance not only for Hindus but for other communities who throng here through out the year and especially during the month of Shravan for performing rituals for the peace of their forefathers and other members who have left for heavenly adobe. This Yatra is a centuries old tradition and people irrespective of their religious faith take part in the Yatra and attend this colorful function every year. This also represents the composite culture of Kashmir. Even during turmoil the Yatra was performed traditionally in the same manner. Residents of Kashmir believe that the annual Shri Amarnathji Yatra has been one of the important catalysts in bringing peace to the state besides benefiting the local tourism industry. 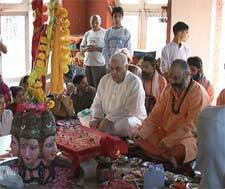 Srinagar, July 31 – The Yatra to the Holy Cave Shrine of Shri Amarnathji is progressing smoothly and 2462 Yatris preformed darshan on Friday. According to a Spokesperson of the Shri Amarnathji Shrine Board, 1299 pilgrims left from the Baltal Base Camp and 586 from the Nunwan Base Camp this morning, on their journey to the Holy Cave Shrine. He stated that another batch of 450 Yatris left Jammu today for the Pahalgam and Baltal Base Camps.